Live in prime time, the Pittsburgh Steelers stood firm at the 15th spot in the 2014 NFL Draft Thursday night by bucking nearly everyone’s mock drafts by selecting outside linebacker Ryan Shazier of Ohio State in the first round. Shazier’s versatile defensive skills may have made him more attractive to the Steelers who are expected to draft at least one cornerback and a wide receiver this year. Shazier was a defensive end in high school but was recruited at the linebacker position. 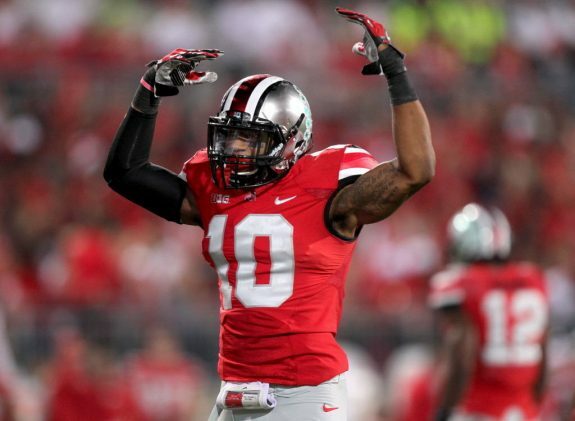 Turning down scholarships from Alabama, Floria and LSU, Shazier committed to Ohio State where he posted back-to-back seasons with 115-plus tackles as a sophomore and junior. In his collegiate career, Shazier combined for 44.5 tackles for a loss and earned All-Big Ten honors. A man with character, Shazier was hailed by Ohio State coaches at being a team-first type of player. The Steelers could use young leadership. His 101 tackles in 2013 ranks behind only Tom Cousineau (142) and Chris Spielman (105) at OSU. Shazier’s ability to get to near-instant acceleration off the line, excellent snap-timing skills and an explosive closing speed was attractive to many NFL teams looking to boost their defenses. Projected as a weak-side linebacker in a 4-3 defense, Shazier may be used more as an edge rusher in the Steelers’ 3-4 base defense. The fact that he can also play defensive end shows that the Steelers believe he will be integral to getting the Pittsburgh defense back on track by taking advantage of Shazier’s unique skill set. 1 Comment on "Steelers select Ohio State linebacker Ryan Shazier in first round of 2014 NFL Draft"